Love Cheesecake? Love Cannoli? 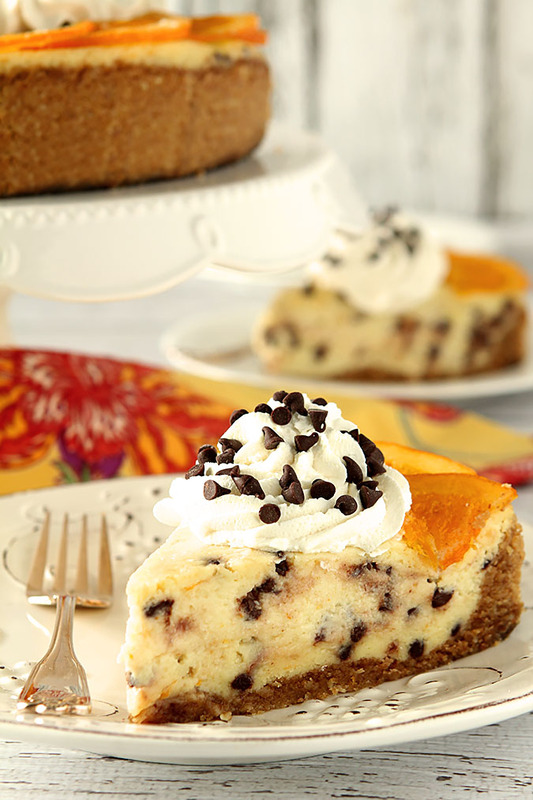 Then you must try this ricotta based Orange Cannoli Cheesecake with Chocolate Chips. It’s both beautiful and delicious! This recipe has been a long time coming. I first saw a discussion about making a cheesecake using ricotta cheese on Facebook months ago and was intrigued. I have never made cheesecake with anything but cream cheese or Mascarpone cheese and I was left wondering why. So I put the idea into my drafts and then forgot about it (like 400 others I have there!). I should not have delayed…the results for this Orange Cannoli Cheesecake with Chocolate Chips beat any inflated expectations I might have had. Light, flavorful and with a flavor combination I simply love; it is divine. I’m not sure why it came to me again recently; it’s not like I had a cannoli incident or visited Italy recently (I wish). Maybe it was the Chocolate Orange Stout Cake I made recently that shared the same flavors I love in cannoli that instigated a memory to bubble up from the recesses of my brain? But no matter exactly what the cause was, the symptoms were a craving and the antidote a slice of this heavenly treat. I’m including it today because I think it would be a fantastic dessert to serve for the upcoming Valentine holiday. Who says all desserts have to have strawberries or raspberries. I say go for the orange! Once I decided it was time to move forward, I read several recipes on the making of a cannoli cheesecake…as well as several comments. Some bakers insisted that a homemade ricotta was necessary (not true) and others cited distaste for the texture when comparing ricotta to cream cheese. 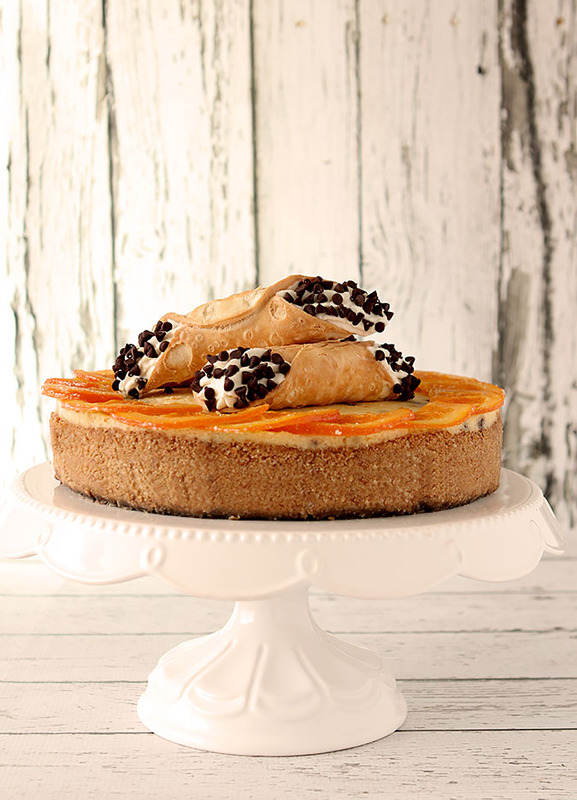 While that second statement might have dissuaded many, for me it only fired me up to make something that would prove them wrong and we couldn’t have been happier with this version of an Orange Cannoli Cheesecake with Chocolate Chips. The texture is still creamy and even lighter than with cream cheese so that was a plus. The touch of orange in the cake and whipped cream was sublime and balanced perfectly with the smattering of chocolate chips. The candied oranges on top? A treat you should not deny yourself. It wasn’t hard. This is a simple cheesecake. There is nothing about it that make it more complicated than others you might have made; save those oranges on top and they are not difficult to make at all. They are optional but please make them. I use the recipe for Grace Parisi’s Candied Orange Slices quite often and it’s easy and the results are wonderful. Even the kids around me will eat these candied treats! While I also may have topped mine with some cream filled cannoli shells you certainly don’t have to; I need to make my efforts photo worthy…you have the luxury of just making something wonderful to eat! Wrap all sides and bottom of a 9” spring form pan securely with a double layer thickness of aluminum foil. Combine all of the crust ingredients together and press evenly across the bottom and 1/2” up the sides of the pan. Bake for 10 minutes; allow to cool before filling. In a large bowl beat the ricotta cheese and granulated sugar until smooth. Beat in flour, vanilla, orange peel and orange juice. Add beaten eggs one at a time and blend on low speed only until incorporated (do not over mix). Sprinkle the chocolate chips with the flour and mix until all of the chips are covered with flour (this helps to keep them from all settling to the bottom of the pan). Sift out the flour and add the chocolate chips to the filling; mix gently and carefully pour the mixture into the prepared pan. Place the cheesecake in a large baking pan and add 1” of hot water to the pan. Bake for 75 minutes or until center is almost set. Carefully remove pan from oven and lift out spring form pan and place on a wire rack to cool for 10 minutes. Remove aluminum foil; run a sharp knife around edge of pan to loosen; allow to cool an additional hour and then remove pan. Refrigerate for several hours or overnight. 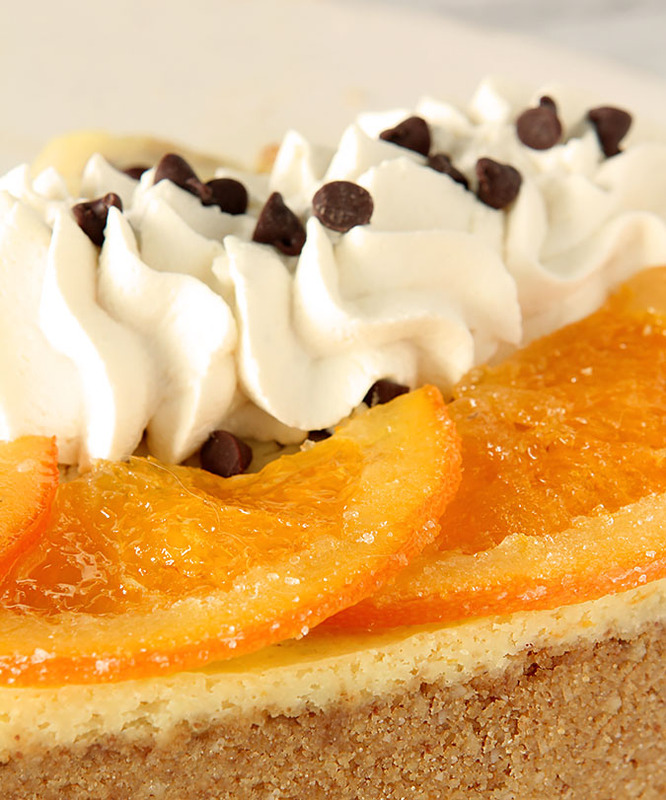 When ready to serve, garnish the top with the candied orange slices, whipped cream and chocolate chips. If you were inclined to serve this cake and want to top it with cannoli like I did, I did not make the cannoli shells in the photographs. I bought some empty shells at a local specialty Italian shop and filled them with the whipped cream mixture. Easy Peasy! there’s so much to bake, and so little time! i agree with you about that set of 400 drafts (i have an idea list that is at an unwieldy 9 pages oops). glad you got around to making this, though, since it sounds amazing!